As Spring kicks into gear, the heat of summer hasn’t hit yet in most places. The time to implement facility changes that could help you control climate costs and provide a better atmosphere for your operations is now, not once the weather has changed. It’s not just a matter of air systems; smaller, incremental changes at entry points or near work areas can have a big impact on worker comfort and productivity. These changes can also save you money. As temperatures climb, more air conditioning isn’t always the best, or even the most effective solution – and it’s certainly not the most cost-effective. Experts say that employee productivity increases when ambient temperatures are comfortable and plummet when they aren’t – as if you need a researcher to tell you that driving a lift truck or picking orders in 90 degrees, high humidity conditions is harder than a dry, cool, comfortable facility. It isn’t just a matter of productivity, either – as workers fight through hot, sweaty conditions, they are more prone to non-heat-related injuries. Strip Doors and Vinyl Curtain Partitions are great tools in this fight – and some of the least expensive tools at your disposal. 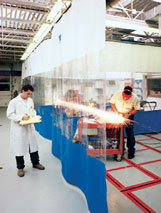 – Strip doors are great to seal off frequently-used dock doors, as well as areas inside a plant. They work not only to help you retain cooled air, but also to keep dust and debris out of cleaner areas of operation. They’re economical, too – a 10′ x 10′ opening can be segmented off using a strip door for as little as $713. The door will help contain air while still allowing easy access for foot or lift truck traffic as needed. – Vinyl Curtain Partitions offer similar benefits but don’t necessarily provide the easy access a strip door can. They’re used mostly inside a plant, to help contain noise, debris, and air quality. Again, for under $700 (prices are as of today, and can change without notice), you can segment off a hot area 24′ wide x 10′ long from the rest of the floor, helping to keep the overall facility cooler than it otherwise might have been. Besides being good for climate control, these work in welding or grinding areas to limit sparks and debris, giving them a safety application. Alternative: High-Speed Doors at the dock and other entry points. For automated, and even more protective access with a high degree of climate retention, consider high-speed door systems. They increase productivity by improving traffic flow efficiency while cutting energy and maintenance costs. These doors can open and close on average at 48″ per second, keeping heating and air conditioning where it belongs – in the building – not the parking lot. It can save you as much as 45% of your energy costs. Passage time costs can be reduced to zero with the proper activation system, meaning that a lift truck driver never has to worry about getting the door open or closed – it’s done for him. Food Processors and Pharmaceutical companies no longer have to shut down production lines for costly door repairs. Manufacturers need to keep traffic moving. High-speed doors save man hours can prevent wear on forklifts and equipment. Cold Storage companies will save energy by eliminating infrared heaters and air curtains as well as saving time by using high-speed freezer and cooler doors. If you can’t air-condition, or can’t adequately do so, there are methods that can cool large amounts of square footage for relatively low costs. Floor fans are all right for specific areas, but they suffer from their high volume. 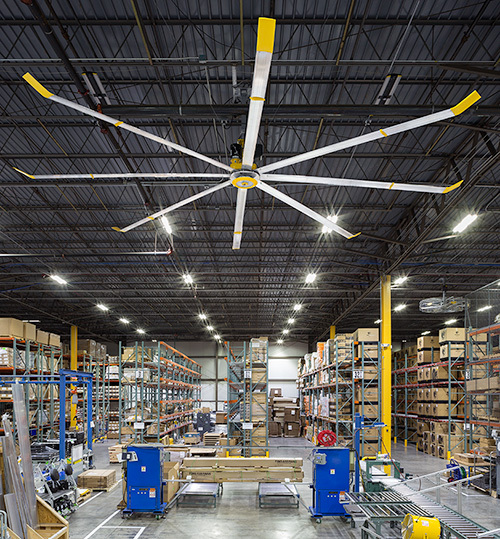 One of the most productive methods is to employ high volume, low-speed fans. 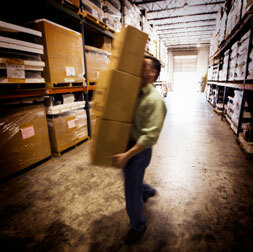 Warehouses have very high ceilings and vast spaces that are often reconfigured when stock and materials change. Warehouses and distribution centers face ongoing temperature control battles during the summer months, with or without air conditioning. Compared to the cost of AC and heating, they are relatively inexpensive and work in a broad variety of facility types. Also, consider Thermal Equalizing Fans. They help destratify air temperatures, which reduces cooling load and can help create a more comfortable working environment. Temperature gradients occur when air is not moving sufficiently to keep rising hot air mixed with descending cool air, creating warmer temperatures at the ceiling and cooler temperatures at the floor, with temperature variations equal to about .75 degrees per foot of rise. This means there could be six degrees difference from the floor to an 8′ ceiling. 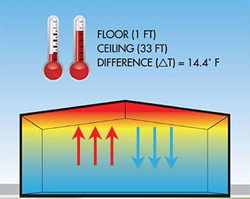 In a 40 ft ceiling room, temperatures can vary 30 degrees or more! Thermal equalizer fans destroy those temperature gradients by creating a vertical air flow down toward the floor while drawing air from the ceiling area. As air is forced downward, it creates vortexes that flow outward from the downward column of air, mixing with each level of temperature gradient along its way to the lowest level. At the floor level, the air is forced outward and up again, circulating from the walls toward the center of the air flow, continually mixing air temperatures. Even during hot summer weather, equalizing temperatures in a building leads to energy gains due to the absence of “over-cooling” in order to cool non-directly cooled areas. Without temperature equalizing fans, workers may be very cool in some parts of the building, while others on the sun-side or upper levels of the building will be very warm – making work conditions uncomfortable for all and leading to lower productivity, let alone the extra energy expense in trying to cool off those warm zones. By equalizing those temperatures, HVAC equipment doesn’t have to work as hard, workers have consistent temperatures from zone to zone, and energy costs go down while productivity goes up.